Activities During Boarding School The key activities that I participated in during my years at The King's Academy were singing in the high school choir, singing in the chapel praise team, and playing saxaphone in the orchestra. Singing in the choir allowed me to attend several musical competitions and programs. I was the featured soloist at the Tennessee Baptist Convention representing the school, and won first place in the school's talent show. I also participated in the Envirothon competition when I was taking Environmental Science. I would have been involved in the school musicals, large and successful productions, but it was not offered in the time frame that I was at the school. I was a student leader for the middle school orchestra and also a senior leader in the dorm. . The King's Academy is a day and boarding school founded in 1884 with an enrollment of 484 students. The school is located on a beautiful campus located in the foothills of the Great Smoky Mountains. It is a unique learning environment in that the teachers and administration promote unity and a sense of community. Some 20% of the student body is made up of international students. The diversity on campus makes for a unique environment among the student body. The president, Dr. Grubb and principal, Mr. Beam, are often seen eating in the cafeteria with the dorm students. Teachers often attend sporting events and get involved in the lives of the dorm students by having them in their homes for school breaks. The other unique aspect is the emphasis on community service. The required community service hours allow opportunities for students to give back while doing for others, whether helping with younger classmates or participating in off campus projects. The sense of community is developed through overnight school trips and off-campus activities. My senior trip was a mission trip to Guatemala. It was a life changing trip for me, in that I found a love for missions as I was able to serve those less fortunate than I, and to be the hands and feet of Jesus. The best thing that happened at boarding school besides the unique relationships and friendships that I developed with my fellow students, was the leadership position I grew into by the time I was a senior. Dorm mom, Sue Koss, assigned seniors to be the leaders over the underclassmen dorm students to form relationships, mentor them, and make sure they did their weekly chores. Even though I originally met with resistance in some commands, I learned from Sue's guidance how to handle difficult situations. I have certainly grown through that leadership experience and couldn't have asked for a better mentor. Of course the lifelong friendships that I have made from those of the countries of China, Korea, Thailand, Mozambique, Brazil, Cameroon, Nigeria, Afghanistan, Congo, Japan and Rwanda can never be forgotten. What I would have done differently when I was at The King's Academy was to participate in a sport. I didn't think I would be able to handle the academic workload and a sport. Looking back I think I would have. I really have no major regrets and would advise kids going to boarding school to study hard and to get involved in as many activities as possible and don't miss any opportunities to be challenged toward future growth. I loved the unique setting of the school campus; it being nested in the Great Smoky Mountains. I also loved the fact that being at The King's Academy allowed me to excel academically, socially, spiritually, and artistically. Great teachers and administration along with the dorm staff, gave a great experience that prepared me for college. 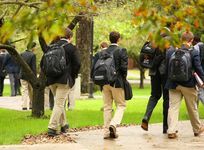 I was in a bad situation at a public school, floundering in my academic studies, and was given a new lease on life by coming to The King's Academy with smaller classes, scheduled study hall, caring teachers and making memories and friends for life. I graduated with honors and was accepted into Carson-Newman University, receiving a good scholarship because of The King's Academy. Words of wisdom would be to study hard and seek help if needed. Also, get involved in as many activities as you can. It is the quickest and easiest way to form relationships, especially as a new student. The girl's dorm is a pretty special place with a lot of history. I hope you choose The King's Academy and have as good of an experience as I had. The teachers at The King's Academy genuinely care about the academic success of their students. So much so that they are available after school for an hour of "back work" or one-on-one help for any student struggling in any subject. I was encouraged to strive to graduate with honors by our wonderful guidance counselor, Mrs. Voiles, after transferring from public school. She mapped out an academic plan for me to achieve my goals of graduating with honors by taking AP classes, and the other required courses. The workload was intense at first as I had been use to block scheduling. Having 7 classes all year was new for me but at a better pace for me to achieve. The teacher/student ratio is also favorable of about 15 to 1.I had already completed my math requirements in public school before coming to the Academy, but my understanding is that the math teachers and curriculum is very good and challenging. I took an additional language class of Chinese which I thoroughly enjoyed and benefited from after being in China. Although I did not participate in the athletic program, except for powder puff football and singing the national anthem at basketball games, the school provides many opportunities for athletic participation. The school offers many sports such as bowling, golf, cross country, basketball, baseball, football, tennis, soccer and cheer leading. The coaches are all caring individuals who promote character building through athletics. Beautiful football and soccer fields as well as a large baseball field and outdoor swimming pool. Participation in sports is not mandatory, but encouraged. I would have played in the excellent volleyball program, but felt like time did not allow. With the new proposed (currently under construction) athletic training facility and the new athletic director, the athletic program should become more competitive and grow. I was involved in the visual arts program at The King's Academy. I took advanced art and was challenged to pursue my artistic talent and loved it. The teacher I had is no longer there, but the new teacher, to my understanding is just as good. Throughout the year there are art competitions available in the area in which students may take part. At the end of the year my class went to the Biltmore Estates in Asheville, North Carolina and made pastel drawings in the beautiful flower gardens. It was a unique opportunity for us to expand our artistic abilities. There are drama opportunities available each year, and every other year the school puts on a musical. Wizard of Oz and Godspell were the two musicals before I came and year after I graduated. As far as the music program, there is a middle school and high school choir and middle school and high school orchestra. There are two concerts per year performed by each musical group in the fall and in the spring. The music program could be improved upon. I think the school will in the future put more of a commitment to the fine arts with additional faculty additions. Since I am a vocal performance major, I would like to see improvements in the fine arts program at my alma mater. Some extracurricular activities that I was involved in at The King's Academy were the annual Eco trip, the spring class trips, and The Chinese Summer Bridge Program. The Eco trip was an overnight trip to various outdoor locations in the Great Smoky Mtns. for the purpose of exploring and experiencing nature with our fellow classmates. On these trips we repelled down cliffs, kayaked down Big Fork River, and learned how to fly fish. The annual spring class trips included Freshmen trip to Lexington, KY and Ohio, Sophomores to Charleston, SC, Juniors to Washington D.C. and New York City, and Seniors to Guatemala. The Chinese Summer Bridge Program occurred in the summer after my junior year when I spent two weeks in the Henan Province learning the Chinese language, history, and art and experiencing the Chinese culture with 9 of my classmates. This was a trip of a lifetime as I was chosen to sing in the closing ceremony in Beijing and selected as the outstanding student in my class. The King's Academy also made senior year extra special with all the special activities such as senior sneak day, senior luncheon, and special dinner for seniors with the dorm staff. Life in the girl's dormitory at The King's Academy for me was unique and wonderful. For my first tour of the dorm I was shown the "family picture" which included girls from 13 different countries. Soon after moving in the dorm, the "family picture" included me. I was one of the few American Students in the dorm. I embraced the different cultures and diversity and enjoyed interacting with the international students. Sue Koss, our dorm mom, along with her assistant Stacy Box, was in charge of room selection. As a junior, my roommate was from Rwanda, Africa which provided for a unique and wonderful friendship. As a senior we were allowed to have private rooms, but we chose to stay together. The rooms consist of two of each twin beds, desks, closets and a sink. The sink and mirror is nice to have in each room and the community bathrooms are down the hall. Dorm refrigerators are allowed and personal decorating is encouraged. Wal-mart trips are provided each Sunday afternoon on the school van. International students are assigned homes during the closing of the dorms for fall and spring breaks. My family, who lives about an hour away from the school, housed several international students during the breaks. Great times and memories. The cafeteria is a short walk from the girl's dormitory. During my time at The King's Academy, the food was just fair. However, the school has a new food service manager and I understand the food is much better. The food is served cafeteria style with the beverages being self-serve. There is no assigned seating, although most sit with their classmates and dorm mates at the evening meal. The cafeteria hours are: breakfast is served from 7:00 to 7:30 a.m., lunch is one hour in an assigned hour time frame from 11:00 to 1:30 and supper is served for dorm students at 5:30 p.m. There is a new program at the school which is called farm to school, promoting fresh fruits and vegetables. A large garden can be found on campus. Some of the food raised will now be served in the cafeteria promoting healthier eating. . The King's Academy is located in the beautiful East Tennessee town of Seymour, but centered between Pigeon Forge/Gatlinburg, one of the largest vacation destinations in the USA, and the larger city of Knoxville, TN. Pigeon Forge/ Gatlinburg is located in the Great Smoky Mountains and provides many outdoor activities such as hiking, white water rafting, canoeing, and skiing. Dollywood theme park is nearby as well as many musical theatres. Knoxville offers great restaurants and lots of shopping. I liked the small town environment and secluded, picturesque campus, conducive to learning and growing as an individual.. The social life at The King's Academy for me involved activities for both the boy's and girl's dorm students on weekends. Such activities included trips to Dollywood, Dixie Stampede Dinner Theatre, various shopping trips and movie outings. There were large trips such as the beach trip to Myrtle Beach and the skiing Trip weekend to Ober Gatlinburg. The "family dinners" were scheduled once a month where the dorm students would cook foods from their home countries in the school cafeteria. Some students were assigned decorating and some assigned clean-up. Then we would have an outdoor activity like Capture the Flag or Volleyball. Fun times! At the end of the year was the large International Food Festival held on campus with food cooked by the students. The annual prom is a great social time held at the end of the school year for high school students held at a local hotel convention center and involves dinner and dance with fellow students. Senior prom was an awesome and memorable time.